When I heard and read about New Super Mario Bros a few months ago I was really exited. While I never played through Super Mario Bros 1-3, I loved Super Mario World, Yoshi’s Island, and basically all the Gameboy installments of the series. So I guess I went with quite high expectations into this game. The game is everything you normally could expect from a Mario side-scroller, meaning your usual platforming as you should know it if you’ve ever played a Mario Bros game. It also has some nice new ideas like rotating platforms that easily throw you into the next lava pit if you’re not cautious. Here also comes my first problem with the game: When you want that powerup, you have to tap the touchscreen. Since reaching for the stylus in the heat of a Mario level is not really the first thing you will think of (since the rest of the game is played without the stylus), your touchscreen will have enough fingerprints on it after each level. 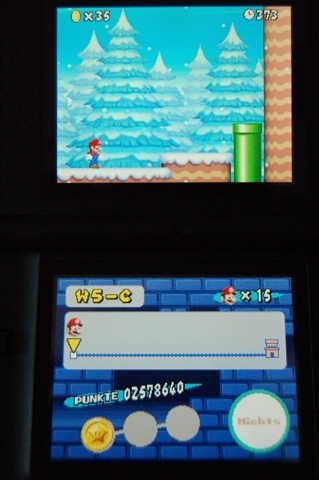 In my opinion it would have been better to use one of the other buttons on the DS instead of that kind of artificial involvement of the touch screen, since the only other use of the lower screen’s touch sensitivity is the ability to select a world (one of the 8, and not the levels in it). ... and in the lower right corner of the touch screen you can see the container for your additional power-up. Good idea, bad implementation in my opinion. My other problem with New Super Mario Bros is, that it’s actually a very short game. I’d say it took me about 10-14 hours to face the final boss fight, don’t know exactly anymore since I don’t play with a stop watch. It just felt really short. After winning that boss fighter you can keep on playing and are no longer bound to the mushroom houses for saving. You can actually save now whenever and wherever you want on the map. Since two of the eight worlds (4 and 7) are quite tough to reach, you will also probably want to open the passages to them after finishing the game for the first time. 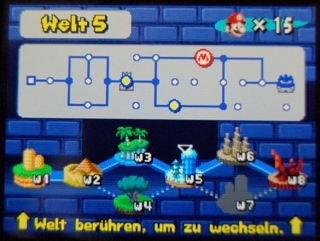 World 4 and 7 are quite hard to reach and are basically optional as you can see here. You could also start hunting for every single big coin you’ve missed while playing through the game for the first time, but from what I’ve seen so far, this is quite useless. All you can unlock with this are different background for the touch screen (according to the cheat page on IGN). This isn’t really worth the trouble. It would have been much better if Nintendo would have put some additional modes into this game. For example some kind of timerun mode (which is more or less in there with the Challenge Mode, but I’m thinking about something else and more flexible ;) ) or a mode were you could beat levels with a friend controlling Luigi and see who reaches the end first. Just some ideas. Speaking of multiplayer: NSMB comes with tons of mini-games that you can play alone or with up to 4 friends via local WiFi. The games require only one game card, so it’s a really great party addition since the most of the games are great.